Since I’m still recovering from a whirlwind trip to Vegas, I’m pulling this post out of my archives for the great big football food link party today! Unless you’ve been on a diet for the past decade, you might already know that Trisha Yearwood has a cooking show and few cookbooks on the market that have some finger licking good recipes in them. Garth and Trisha ain’t skeered to eat some good ol’ down home greasy food that we all love here in the South. I was searching around online for a party recipe a few weeks back and stumbled on Mommy’s Kitchen where I found this recipe for Trisha Yearwood’s Charleston Cheese Dip. The guests at my party devoured this stuff. If you need a great appetizer that will be a huge hit at a party, look no further. If you are highly offended by sky rocketing fat grams and bacon grease, you might want to skim over this one. Seriously, y’all. Trisha wasn’t playing around when she wrote this recipe. Preheat oven to 350 degrees. In a medium bowl, mix the mayonnaise, all the cheeses, green onions and cayenne pepper. Transfer the mixture to a shallow baking dish. Top mixture with cracker crumbs and bake for 15 minutes, or until heated through. 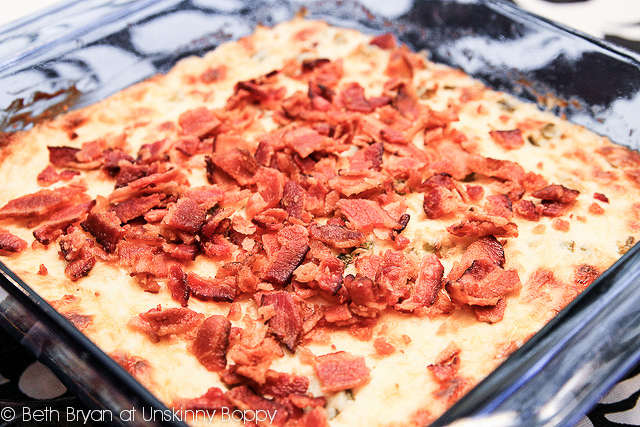 Remove the pan and top with the bacon. Serve immediately with corn chips, pita chips or crackers. I turned the broiler on mine for just a minute at the end of the cooking cycle to give it a little extra of that golden brown bubbly goodness. This stuff is evil. And oh so delicious. Everything is better with bacon!!! Gotta try this! Oh, we don’t get that cheese or those crackers either but I’m sure it would taste great with the stuff I get! HOLY COW does this sound yummy! I mean cheese and bacon? Sign me up! 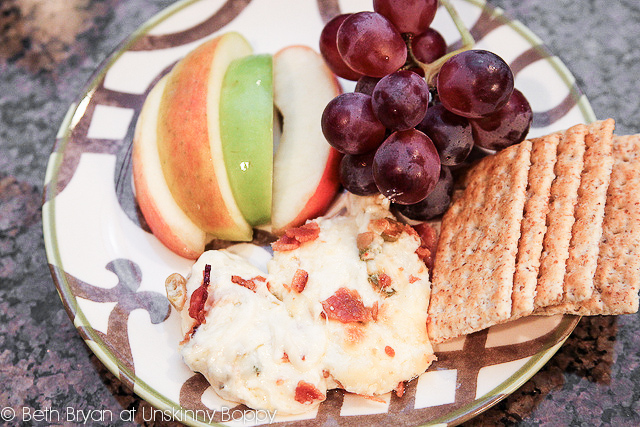 My friend Becky makes this dip, and it is usually gone within minutes! I am so ready for that party…I’ll bring drinks!!! Beth, I have seen this recipe and I think I even pinned it on Pinterest. So thanks for showing this again. I plan on making this next weekend! I pinned this a while ago, and with your endorsement I think I better make it. What’s a few fat grams among friends? Do tell about Vegas, unless what happened there has to stay there. Sounds great. I’m going to try it for the Super Bowl! I’m going to someone’s house for the game this weekend and thought this would be fun to take but, since I’m not able to bake in the oven I was thinking of making it in a crockpot and taking it to keep it warm throughout the game. Any thoughts or advice? knowledge every day by reading such nice posts. Top mixture with cracker crumbs and bake for 15 minutes, or until heated through. 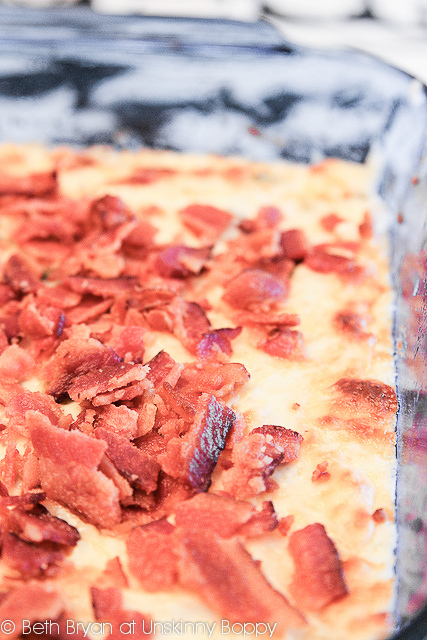 Remove the pan and top with the bacon. Serve immediately with corn chips, pita chips or crackers…..